Our expert floor sanding company provides wood floor gap filling in London. 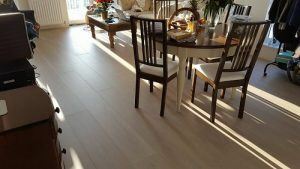 The craftsmen at FK Floor Sanding bring their experience, skills and professionalism to bear on all aspects of caring for wooden floors in both domestic and commercial clients throughout all Central and Greater London areas. We provide services that range from fitting to floor sanding to full restoration and repair work. One aspect of this is gap filling. Using strips of wood is thought to be a particularly effective and long-lasting material to use to fill wide gaps in floors. It works especially well on softwood floors and the wood of choice is often pine. The process is not complicated. The strips must be cut to the correct size so that they fit neatly into the gaps. The strip is covered with glue on the sides and underside before it is put carefully in place. The strips are left overnight so that they settle and the glue cures or dries properly. The following day they are sanded until they are flush or level with the surrounding floor. While this process is time consuming it is well worth it as it is a long-term fix that looks good when the entire floor has been finished. Acrylic mastic filler is a further option. The colour is carefully matched to the wood floor being repaired so that the filler is not obvious in the finished floor. While this is also an easy and quick fix, the filler eventually works loose and the work has to be redone. In addition, it’s very hard to get a perfect colour match. This is where our expert wood floor gap filling in London comes to help. Using resin mixed with sawdust is an easier and quicker option to fill gaps in wood floors. As a result it is also perhaps the most commonly used. However, it only works if the gaps are very small or narrow (3mm or 1/8”). It should also be noted that it is not a long-term fix. Sawdust is taken from the floor being sanded and repaired and then mixed with resin to form a paste. Given one uses dust from the floor there should be a very close colour match when the floor is finished. This paste is then worked into the gaps. Once the paste has dried completely it is sanded so it is the same level as the floor. The reason that this is not a long-term repair is that wood moves as weight is placed on it. The resin filler works loose as the floor moves and resin itself shrinks over time. The end result is the gaps will appear again at a later date. Call us on 020 3909 7641 for further information or to book an appointment for the best wood floor gap filling in London.